Daisy is a young modern girl with a disturbing past. The novel opens with the death of her only guardian –grandmother – she dies in the hospital. Her demise leaves Daisy forlorn and sad. While going through a tiny locket falls down a scroll with a message for her. Back at home, with the message in her mind, she begins rummaging grandma’s room. The trail goes apt and in the treasure box she gets hold of a bottle. In a fit of anxiety when the bottle drops off her hands, she feels a swirl of bizarre ambience around herself; she is scared and feels trapped. 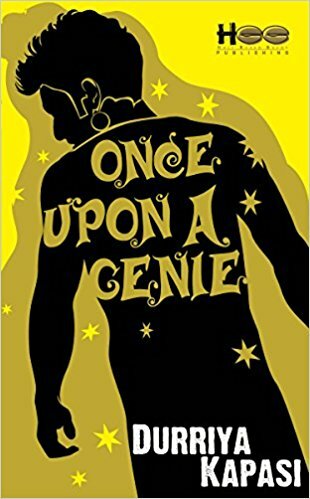 There she meets an astonishingly handsome genie – Khalil Muwahid. Khalil thanks her for freeing him from the bottle. Much like a fairytale, Khalil is obliged to fulfill three wishes for her, with no conditions at all. Long before her first wish, romantic clashes subtly take place between them. Khalil being lascivious in nature, kisses her many times in a short span of time, on the other side, Daisy finds herself acceding to his ravishing looks. Khalil is invisible to the world but Daisy can see and touch him. As per the first wish, Khalil takes her to his native world – a place much like a paradise, full of strange beauty and light, and there people, animals and birds are of extraordinary powers. Khalil’s mother and brother appreciate her presence but others frown because bringing a human to their world means risking their existence. It is against their ethos. Khalil is strictly ordered to erase her memory which he does by kissing her for very long time while cuddling her in a magical pond. Following the memory erase, both become depressed and Khalil full of contrition remains absent minded around her. A sense of love and frustration pricks him. Though he expresses his love to her, but somewhere deep down in his heart he has a hunch that once her three wishes are fulfilled he needs to go back to his own world – the world of Jinns. Darren is Daisy’s college friend, who notices her changed behavior and tries to dig deep. Eventually he comes to know that Daisy is in love with a genie. Despite that they carry on dating each other, casual kissing and also participate in a dance competition. Daisy has been shown a safe player – she keeps Darren as a backup just in case Khalil goes back to his world. So, as the novel proceeds a love triangle forms, and to add a spray of spice, Jessica – Darren’s sarcastic girlfriend - makes entry at few instances to steer the sub plots. As advised by Darren, her second wish is to tour the world. For that Khalil gives her drifting powers. She can go to any place in the world by just focusing on that place. First she experiences Malaysia with Khalil as her chaperone. Next, she goes to France along with Darren, where Darren exploits the powers for petty aspects like hotel stay and food. The drifting power remains with her for long time and she uses it whenever she feels like. On the other hand, Khalil keeps a vigil on her all the time and often covers up her household chores like cooking food, house cleaning, etc. Following the dance competition which they win, Darren is diagnosed with cancer. Daisy helps him and his parents in the hospital. However, around the same time Daisy discovers that she is pregnant with Khalil’s child. When the situation worsens and Darren was about to die, Daisy has no option but to kneel down for the third wish – to save Darren’s life. Khalil foresees the event, thus, he is mentally prepared and deliberately nudges Daisy for the third wish. As per the wish, Darren recovers rapidly but Daisy’s sacrifice of her own love makes him sad. ‘Once Upon A Genie’ is a fantasy romance novel by Durriya Kapasi. The novel is staged against two worlds: humans and Jinns. Daisy is apt at shuttling between both the worlds but the cultural settings of Canada, where most of the novel is based, lacks intensity. Also the novel – though a good love story – sounds Indian despite having non-Indian characters and lacks conflicts – there should have been more subtle conflicts. A little research could have made it more riveting. Overall the book is good, a racy read for young readers. The writer seems to be a fabulist!